1. I will only offer feedback to those who ask for it. Post your request in this thread. 2. Please only request one entry feedback per week, rather than just ask for feedback on everything. This is so I don't get completely swamped. 3. Please provide a link to your entry in your request. 4. If you ask for a critique, you have to be prepared that that critique might be negative. I want to try to highlight how a MOC could be improved, rather than just praise the good things. 5. Just a note - in some categories there were a lot of very high quality entries. So it's possible there's nothing particularly wrong with your entry, it might just be that another one was a little bit better (especially with multiple judges scoring, one judge might put entry A on top and another put entry B on top). Thanks for putting all the work into doing this again Bruce! When you did the Critiques Thread a few years back, I really appreciated it. Glad to see it back this year! Thanks again so much for doing this! First up, there's nothing really wrong with this, it's a nice little MOC. 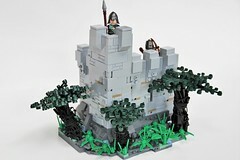 Unfortunately, "nice little MOC" is a bit of a fatal description given some of the other entries in this category. I particularly like the way you thought out of the box on the trees design here. One problem is that in a real defensive situation you would chop down those trees right by the walls - they mess up lines of sight for archers and make it easier for attackers to get close. I also really like the dark gray part that's turned at 90 degrees from studs-up to studs-out at the base of the wall. I think you got some interesting and realistic texture there. The walls are nice, though I might have gone with a touch less texturization on those - having some color variance, gaps, plates a half-stud out, tiles stuck facing out, AND "brick" bricks makes it kind of busy. This is more of a personal choice area, though. Also, you use a slightly different style to make the merlons on the tower portion versus the lower walls - both are nice, but it seems they should be consistent. On the inside of the walls it's a little bland - I get that the inside walls may be more dressed than the outside walls, but a little bit of texture and/or color variation in the walls would have helped, and I definitely would have used a different color for the allure. Also there should be some way to get up to that tower. Oh, the arrow slit on the outside is really cool, but it's also a false one since on the other side there's a black wall. First up, of course you did well overall and especially in this category with your winning entry, so this isn't at all bad, just not at the level of your other one. I really like your roofs, using the cheese slopes, the colors, and the way you used those little claw elements to edge the roofline. 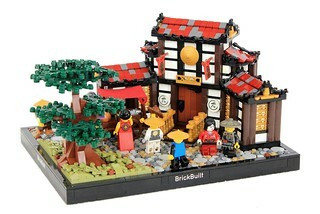 I also really like the Asian architecture you've got here. The cobblestones and the subtle landscaping around the tree are all nice as well. The main problem here is that this was a "Traveling Salesman" entry, but it doesn't really play to that at all. If you took out the guy with the fish cart, you wouldn't really change the MOC at all - indeed it's a little hard to even see the cart behind the tree. Also, I'm a little confused as to why he set up shop there, as it seems like this is the front yard of a residence. If he were at a crossroads or in a town square people would be coming to see him, or if he were just bringing his wares to the front door of the house to sell to the owner, it would make more sense. Plus this is a little bit of an explosion of harsh colors. All of the color variations individually make sense, but all together they're a bit much. Maybe if you didn't have all of the pearl gold accents on the building, or if your cobbles were essentially all the same color, it might make some of the other details come out more. BTW, your other traveling salesman entry was perfect and one of my favorites in the contest. Isaac, you were the "always a bridesmaid, never the bride" of this year's contest. You did amazing and placed high up in lots of categories and in the overall master builder race, but didn't hit the top of any of them. This was actually my favorite in this category, but in the combination of all of the judges' votes it was slightly edged out. So I've got nothing really wrong to say about this MOC. I might have called it a keep rather than a castle, since to me a "castle" implies curtain walls, a gatehouse, etc, but OTOH you've got all of those Scottish tower houses named Castle ___, so that's not a big deal. I might have chosen some of the photos differently for your five - maybe one from a low angle looking up and one more close-up of the detail. Obviously now post-contest I can go look at the larger number of photos you've got on your own site and see these shots. I particularly love, btw, the little bed built into the window of the kids room. Also the incredible attention to detail that the various fireplaces on the inside line up with the chimney. Oh, one critique, since this is almost all dark gray and black, I would have taken most of the photos with a white or other light-colored background, as some of the details are harder to see here. This was a nice entry, but as with LittleJohn's "Fresh Fish" above, there is almost nothing to make this a "Traveling Salesman" creation. 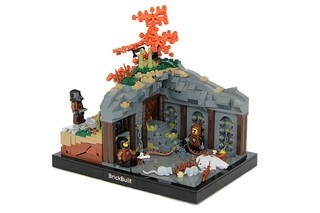 Yes, there is they hobbit with a cart, but if you removed him it wouldn't change the actual MOC at all. Even the townspeople seem to be completely ignoring him, as if they also realize that this creation isn't really about selling anything. I really do like the architecture, and that ballista, and this MOC probably would have scored better in other categories (say misc. small) as a straight-up Hobbit MOC. 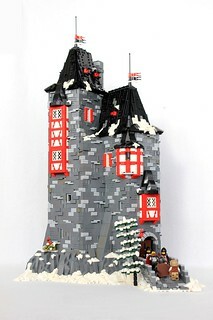 If your really wanted to make this a "Salesman" entry, you could have done that by repositioning the figs to be engaged in purchasing from the salesman, focusing your photos on the salesman - from a figs eye view especially, and gotten rid of all of the detail photos of the battlements, the architecture, the town drunk, etc. As to critiques of the MOC itself, one suggestion is that it should be higher up above the water's surface, as it seems that this town is in danger of being flooded in the rainy season. Also, if this is Laketown, it shouldn't have stone structures and streets. I actually just happen to have the Hobbit on the shelf by my desk, and here is the description: "A great bridge of wood ran out to where on huge piles made of great trees was built a busy wooden town, not a town of elves but of Men, who still dared to dwell here under the shadow of the distant dragon-mountain." Even if we're not constraining ourselves to the source material, it doesn't make sense from a physics perspective to have wooden piers and then stone towers built on top of them. Or you can get a good octagonal roof with bricks/plates, but it can be very parts-intensive and probably is a bigger roof, like this example by Nick Runia. More elevation change in the landscaping would be nice (though that rock is really neat and the color variation is interesting). Also, I think that's supposed to be his woodpile over on the left-hand side of the building, but he's got five small sticks - not really going to last him the winter. Finally, I like to watch the YouTube channel CinemanSins, where they critique movies humorously. Anyway, one thing they often note is when in dialogue a character refers to some past adventure that would have made a much more interesting movie than the one that is actually on the screen. You fell into that here - in your description you talk about this hermit living off in the woods with the birds, which made me think of St Francis preaching to the birds, and also him maybe being attacked by brigands. Both of those suggested more interesting MOCs to me than this one. Oh, the arrow slit on the outside is really cool, but it's also a false one since on the other side there's a black wall. I'm pondering your last comment Bruce and re-looking at Legobeethoven's MOC. Perhaps, and I'm just rambling here, the false arrow slit IS intentional. Think about it. You're the approaching enemy, you see the arrow slit, you naturally assume that fire will come from that point, you attack it. Meanwhile, the attack comes from a completely different angle having nothing to do with the arrow slit which turned out to be false. I'm curious to know what you thought of my castle. Well, as category winner I obviously won't have much negative critique on this, though I did note above that I slightly preferred Isaac's entry. My favorite things about this are the snowscaping and the classic-castleness. Your snowscaping is really well done here. It feels like you built this MOC, and then had the snow fall on it naturally. I particularly like the drifts on the battlements and the guy scooping off the one part. Also the little bits on the bird statues. Probably the only bad snowscaping, IMO, was the layer of tiles across that sloped out part of the tower roof. I think that would have been better if you'd just worked some white slopes into the normal roof. 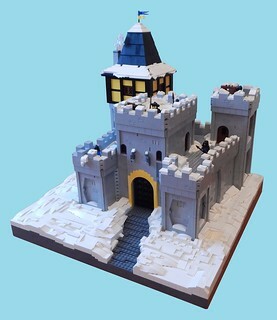 On the classic-castleness I love how you referenced the original BFF and other sets from that era, with the yellow half-timber section and also the yellow arch over the gate, also just the general studs-up building through most of the MOC. Another great bit was the mosaic of the falcon, though it seems that should have been more prominently placed than on the back corner of the castle - probably that should have been above the gate, with those falcon figures placed on the two towers to the left and right. I also really liked the ratchet motion to raise the portcullis. I guess the reason I gave the edge to Isaac's was that yours was a little less ambitious, with a simpler floorplan and building style. Also, yours seemed a little bleak and lifeless inside. Maybe that was intentional, but I do like the idea of coming in from this cold barren snowy journey and entering the castle and suddenly you're surrounded by warmth and people, with a roaring fire, meat roasting on a spit, free-flowing ale, etc. Thanks a lot for the critique, Bruce, I shall try to keep the category in the forefront of my builds in the future. I really enjoy getting feedback (even if it's negative), so thanks for creating this thread!